Check the Fien Print: MovieWatch: "The Assassination of Jesse James by the Coward Robert Ford"
MovieWatch: "The Assassination of Jesse James by the Coward Robert Ford"
You'll excuse me while I muse on the fact that Emmanuel Lubezki and Roger Deakins, probably my picks for the best cinematographers currently working, have collectively been nominated for 9 Oscars without a win. That's a thought I'm only having because I'm musing over similarities between Terrence Malick's "The New World" (shot by Lubezki) and Andrew Dominik's appealingly cumbersomely titled "The Assassination of Jesse James by the Coward Robert Ford" (shot by Deakins), a movie that's almost certainly Malick-esque, though probably more like early Malick than later Malick. The comparison really boils down to an "Ooooh... Pretty pictures" response to both movies, as well as a "Dear Lord is this movie going to tank in Middle America" reaction. "Assassination" has a robust 160 minute running time, which is almost the exact length that "The New World" was when critics saw it and when it first opened in Los Angeles and New York. By the time it played in theaters and basically tanked ($12.7 million domestic, just over $30 million worldwide), it was just over two hours. Like "New World," "Assassination" is a piece of historical revisionism, first a foremost. It's an attempt to find something historical in a figure who has basically become an American folk legend (or the fodder for a Disney musical). Like "New World" is also probably more of an art house movie than the studio involved might have initially anticipated. While "New World" was intentionally alienating in its depiction of the pre-colonialized America, using its seemingly hours of Q'Orianka Kilcher prancing around fields of grain as an image every bit as alien as Neil Armstrong bouncing around on the Moon, "Assassination" isn't at all inaccessible. The narrative is straight-forward and linear and the character progressions make absolute sense. It's an aesthetically lovely movie and an intellectually intriguing movie, but I can't help but wonder if a piece of "New World"-esque trimming might have benefited it. "New World" was never going to be a straight-forward romance or history or whatever Malick and New Line cut it down to being. "Assassination," while often magnificently made, is undeniably self-indulgent as well. The obvious comparison that I assume everybody is making is to John Ford's classic "The Man Who Shot Liberty Valance," though "Assassination" may give an even more complicated spin on that oft quoted line: "This is the west, sir. When the legend becomes fact, print the legend." 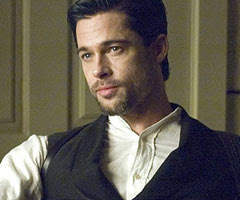 The disconnect between the legendary Jesse James (Brad Pitt) and the factual Jesse James (the man introduced to us in Hugh Ross' opening voiceover and throughout) is part of what motivates Bob Ford (Casey Affleck), whose eventual actions are unlikely to shock anybody, but for me the movie got even more fascinating after the event referred to in the title. It's not that I didn't like the supporting work by folks like Paul Schneider, Jeremy Renner and particularly Garret Dillahunt, but their characters often distract from the movie's core focus. The connection between Ross's narration -- fact-based, dispassionate -- and the imagery in those scenes was perhaps my favorite part of the whole film. They're shot with a distorted point of view, as if through either the lense of an old camera or through the thick, slightly warped, glass windows of the period homes. The voiceovers present the truth over the distortion, a truth that ultimately gets in the way of the legend, the myth. Pitt's performance as James is similarly hard to read, similarly veering between iconically charismatic and luster-free real. Since I'm assuming that's exactly what Dominik wanted -- an A-list movie star giving a performance that's sometimes showy and sometimes blends into the background -- Pitt deserves his kudos. Ditto with Affleck, whose fall output -- this and "Gone Baby Gone" -- will assure both his stature in the creative community and his anonymity for mainstream moviegoers. OK. I've got to post this or else it will never get posted and since I hope to catch a couple additional movies this weekend, I may never catch up. One last thing: It ought to be against the law to waste Mary-Louise Parker as badly as she's wasted here as James' almost dialogue-free wife. There are things Parker conveys successfully through silence, but a lesser actress could have filled the part without causing me to lament the lost potential. i like the lyrical tone roger deakin's work (or is it andrew dominik's?) brings out in your writing. which means i'm looking forward to reading your thoughts on _in the valley of elah_, a film i saw this afternoon. it's difficult for me to remain objective about it, since tommy lee jones seems to be doing a fairly good impression of my father. (or at least my father in a particular mode.) i liked it very much, not least the cinematog., even if it does hit you over the head a little bit with some big, meaty ham hands, culminating in the last song of the soundtrack playing over the last image of the film. jones is in tip top form, though, throughout. elah, jesse james, eastern promises and 3:10 to yuma -- phew! that's a lot of performative heteronormative masculinity in a month of cinema! i think i could use a nice, gooey chick flick or rom-com just to change things up. So you're saying you're looking forward to "The Heartbreak Kid"? my inability to stay on board with most ben stiller vehicles for longer than 20 minutes without wearying of his desperate and hammy shtick is probably going to cancel out my desire for romantic comedy fare, at least as far as _the heartbreak kid_ goes. i rewatched _umberto d._ tonight on dvd, which might have provided enough of the sentimentality and alternative masculinity i was craving. grazie de sica! I hope Pitt's movie tanks. I am tired of seeing and hearing all their good deeds. A majority of Hollywood stars manage to "do good" w/o anyone knowing. Their constant attempt to manipulate people into liking them is ridiculus. Get off the constant PR hype. ENOUGH. I know it's hard sometimes, but if putting aside the InTouch magazine or clicking away from TMZ is the step you have to take so that you aren't rooting for the failure of a movie that's better than 95-to-99% of what's out there than it's a small price to pay. Because if you don't care about the best the industry has to offer, why do you care about movie stars enough to be constantly aware of their good deeeds anyway? Oh, Daniel, I love that little bit of celeb gossip advice. I stopped reading In Touch/Us Weekly/most gossip websites about a year ago, and I am so much happier now with entertainment in general. Yes, I live in L.A. and work in the entertainment business so I still hear a lot of celeb gossip, but it's so much more muted and normal now. I enjoy movies and TV much more not knowing most of the drama that happens behind the scenes.